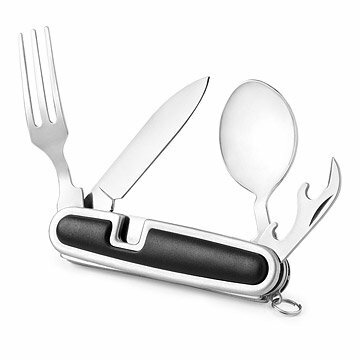 This handy utensil set has a fork, spoon, knife, and bottle/can opener that folds up like a pocket knife. Whether you're hiking the hills, out on the road, or just on your lunch break at the office, this is going to be your go-to tool for eating on the go. Built like a folding pocket knife, it includes a sturdy metal fork, spoon, knife and bottle/can opener. Pop open the fork and spoon, and with a nudge the housing splits in two for easy, two-handed use. The durable, dishwasher-safe utensils are stronger than plastic flatware, and can be used again and again. Made in China. Would change the design if I could. This is a great idea to use in place of plastic utensils, like in the office. However it's not practical for camping so I wish it had a butter knife to spread things instead of a can opener, then it would be PERFECT. Nice compact design, great for work environment. Great small compact design, easy to use, easy to clean. The only thing is that when folded into it's compact design, the spoon and form heads are exposed to the elements. My dad uses the set when he goes on his 1-2 week hunting trip in the mountains of Colorado. He found it VERY useful, and always keeps it with him! Perfect to pack in lunch boxes & priced low enough it's replaced shoul it accidentally get tossed or lost. All 4 of us are culinary judges for the American Culinary Federation and we have started to use them when we judge. Great for camping or traveling on the road.